Today’s photo depicts Washington Ave. and the 4th Street streetcar line as it meets the Eads Bridge Station. 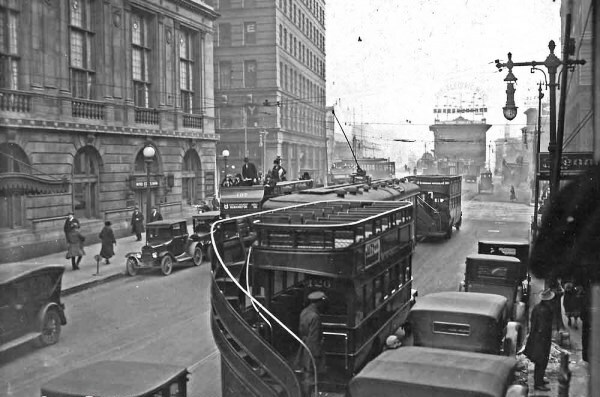 The photo is dated 1924 and addition to the streetcars, three double-decker buses that were the competition at the time can also be seen. We picked this photo in honor of the grand opening of the National Blues Museum taking place tomorrow. The museum is just a few blocks away from the scene pictured on Washington Avenue. Photo courtesy of the Joe Sonderman collection. 3rd and Washington Ave. Downtown St. Louis.